We would like to share with you a little more about who we are at Echo Valley Ranch. RON OGREN was raised on a South Dakota Ranch, and has always had a passion for our outdoor lifestyle, and being with people. He loves all aspects of our ranching life, whether it's caring for new calves or lambs, fixing fence (a never ending job) or chauffeuring hunters with our handy-bus, aptly named the Kennel. He gets his fix of farming by designing and planting our hunting food plots. He is a great teacher and is keen to share what he has learned. Being a great story teller, he has done his share of banquet comedy, and really enjoys the camaraderie of our guests. His humor has helped see us through some tough times! If a tour of the ranch on a horse drawn wagon is of interest, Ron would be tickled to hitch up his team of quarter horses and give you a ride! LYNN OGREN , a Canadian, was raised on a ranch in Alberta. She grew up in an international family, with relatives from England, New Zealand, Australia, and of course Canada. Through these connections, we have had the privilege of hosting many international guests. Cuisine is her focus, as she used to own a catering business in Canada. She spends many hours on her horse, especially if her grandchildren want to go for a ride, and enjoys taking others along. She just completed a Cook Book honoring 100th Anniversary of the Cross Bar Ranch where she grew up. You will often find her on a pasture walk evaluating the grass and scheduling the next move. She's happy to have you join her. MICHAEL AND SHANLEY DORRIS, (our daughter and son-in-law) with their 2 children, are very involved in our hunting business. Mike is an avid hunter and tournament fisherman and has been a great source of knowledge and inspiration as we keep adding to and developing our habitat and facility. He has three amazing Labs-- Drake, Jake and Lilly, who are important members of the team as well.. Mike coordinates all of our hunt activities and can also arrange some great fishing on the Missouri River. Shanley is responsible for our brochures, website maintenance, and our promotional materials. She is truly an asset at mealtimes, keeping the cook organized, and on track. Their children, Kaiden and Karsyn, are usually a source of entertainment and youthful energy for everyone they are in contact with. STACEY AND TIFFANY OGREN (our son and daughter-in-law) currently live on her family ranch in Montana. They have a new addition to their family named Rylee Renae who is a future Montana cowgirl. 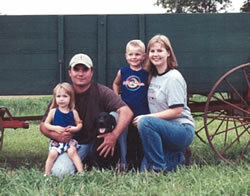 Stacey has had a lot of influence on our land over the years with his knowledge and dedication to range manage- ment. They both train horses and enjoy roping competition. We are only sorry they donâ€™t live closer, but are always happy to see them when they are home. Our focus at ECHO VALLEY RANCH is to create a top notch experience for all of our guests. Whether your interest is hunting wild birds in fantastic and diverse hunting areas or an exciting working ranch vacation, you will find it here. We rotational graze to enhance our grasslands and habitat. Cattle are moved often, allowing for plenty of hands on participation. Because we are committed to having exclusive groups, we do our best to hand tailor your package to suit YOU . If you have any special requests, please be sure to ask us. We have had many of our guests offer to write letters of recommendation, so please feel free to ask for references. Please give us a call if you need further information. We are always happy to visit about what we do at Echo Valley.